External hard drive partition file recovery,how to recover lost partition on external hard drive - recover lost deleted formatted MS word excel, photo, music, video files from EXFAT/FAT32/NTFS External Hard drive partitions. Use "unformat" to recover files from formatted external hard drive partition. Use "recover partition" to recover lost data from deleted,lost,changed,damaged external hard drive partition.And if the size or position of external hard drive partition is changed by format,It can not recover with "unformat" ,so you can use "recover partition" mode. Maybe the memory is the most long life-span device in whole computer, then comes the External Hard drive. People always saves data in their External HD and do no backup of those important files, for they thought data in External HDD is 100% safe for at least 5 years. However, External Hard disk drive is still fragile when the time passed by and having dangerous situation that all data in that drive will be lost by false operation. 1, Bad Sectors. Bad sectors like virus, they turn stronger and stronger gradually if you do nothing about bad sectors. Sectors are used for saving data, and once the sectors turn damaged, your data is incomplete and you can't read, modify or copy them any longer. 2, Whole hard disk is formatted completely. This happens when you are installing operating system. The system installation wizard will guide you to format the disk, especially installing other kind of OS except Windows. After formatted the whole hard disk, your data in all partitions will disappear. You can never get it back unless using hard disk partition recovery software. 3, The file system on hard drive is damaged. This situation seldom happens, however I don't mean it never happen. It happens under some extremely special conditions. The whole file system crashed. And you can not access hard disk unless format the whole disk. Under these situation, if you wanna recover files in hard disk partitions, you must use hard disk partition recovery software to restore them all. Now that you find this article, you must have already meet the problem as we mentioned upper. 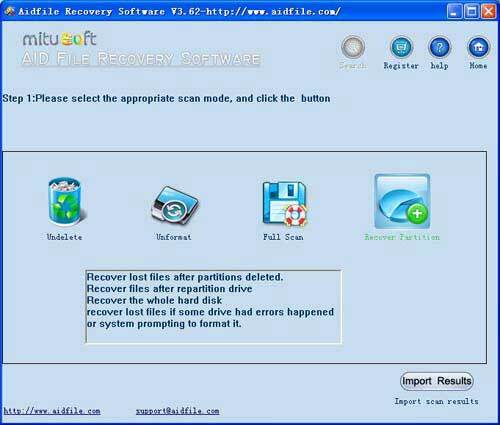 So what we recommend is Aidfile Recovery Software. It recovers lost, damaged or formatted hard disk partition files in a quick and complete way. Try to recover them now! An external hard disk drive is quite a useful piece of equipment. It is a type of hard disk drive which is externally connected to a computer with plug-and-play interfaces such as USB or FireWire. The function of the external HD is as same as internal HD (or the normal hard drive). Although the external hard disk is not as fast as internal models, an external hard disk drive still has a lot of advantages: it is portable and it can be operated on a plug-and-play basis, and users can back up or store important data separate from the main internal HD securely and safely. In hard disk, it is quite often that the file directories disappear suddenly and some disordered and odd filenames appear. This is caused by a USBC virus. In such case, you may try a full scan and recovery with our software. 1. 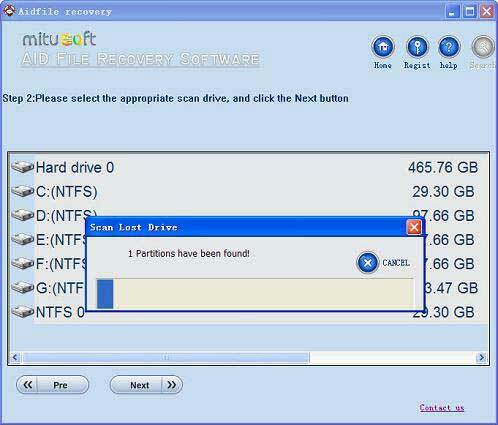 Select the "Recover Partition " or "full scan"